This year we've decided to follow Valve's example and to change the way we do our bi-yearly giveaways. We'll be holding a big auction, and to participate you guys will need to collect Hyperion Gems by making forum posts at least 1,000 characters long, or playing at least 5 hours straight on our TF2/NS2 servers or by simply donating money. You will be also able to find hidden Hyperion Ducks on the forums and in-game. Each duck is worth 5,152.25 Hyperion Gems. On December 25th, the first Hyperion Auction will begin, and you can bid your Gems (but you can't bid Ducks... that's inhumane) to maybe win a game that's currently -85% off on Steam. Oh wait, I've just been told by our web team that we need to shut the auction down because people are abusing/cheating the awesome Gems/Ducks system our bored TF2 designers came up with. Well, at least they can go back to work on new maps, game modes and more... Right? Yes, very sarcastic before the holidays, isn't it? Don't worry, we're not changing a winning formula. As usual, you only need to have a valid forum account (including SteamID), to join our public Steam group and make one post in the giveaway thread linked below. So easy a geico could do it. We've got 14 months of Donor membership and lots of Steam games for you guys. And as usual a big Grand Mystery Prize on January 1st. We're activating our Bonus Round challenge once again: this time we need 60 participants by December 31st to add a 2nd GMP! To participate, please follow this link: http://hyperiongaming.org/index.php?topic=770.0 and make sure you read the giveaway rules carefully. 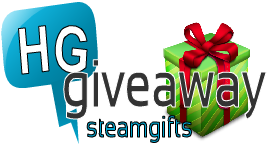 The winners will be picked randomly from the giveaway thread from December 25th to January 1st for the Grand Prize. You may register for the giveaway at any time December 31st at midnight Pacific Time. Fern is giving away a copy of Assassin's Creed 4, the Pirate/Assassin game, which I hear is 1,000 times better than AC3 and its emotionless protagonist Connor. But a good giveaway also needs Tier 2 prizes, right? 2). One month of Donor membership! Already a donor? Fear not, it will simply extend your membership! 1). One month of Donor membership. It's easy! Click this link: http://hyperiongaming.org/index.php?topic=649.0 and make sure to read the rules! Good luck!